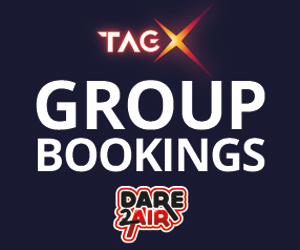 We are now taking group bookings for both Dare 2 Air and TAG X. These are perfect activities for team building or just some fun with a group of your friends. 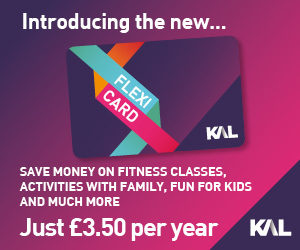 This is available on all sessions on Thursday & Fridays and from 14.00 onwards on a Saturday and Sunday. Management reserve the right to withdraw any offers or products. 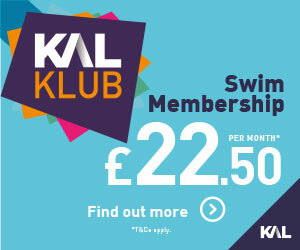 What is the difference between a group booking and a party booking? 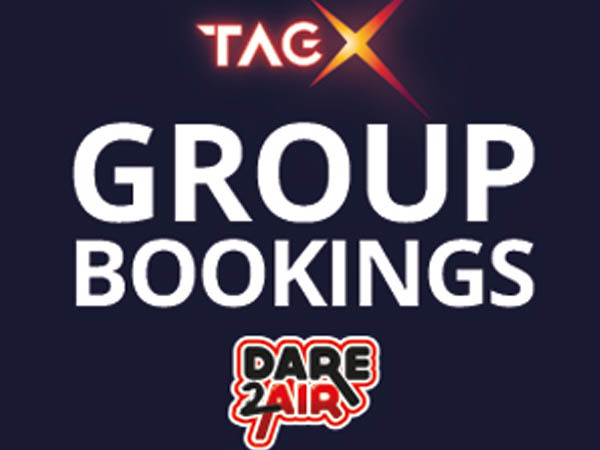 A group booking is for the attraction only. It does not include a party host, any food or a party room/area. If you are ordering food as part of your group booking please be aware we can not guarantee all food will be served at the same time. Upon arrival you will need to go to reception as normal to register your attendance. There is no private hire or exclusive use for these bookings available. For a party booking you will have the attraction activity as well as a party host, who will greet you in reception and will take you to the attraction. Once you have finished the host will then guide you from the attraction to the party room/area where your food will be served.